We have observed a few incidents where teams who were using newer Motorola phones have had disconnects similar to the ones described in an earlier Troubleshooting article (see Motorola E4, G5 and G5 Plus Phones Disconnecting Momentarily). These newer Motorola phones have support for 5GHz Wi-Fi Channels. What we observed was that these teams saw occasional disconnects, primarily during the autonomous portion of the match with these 5GHz enabled phones. For these newer Motorola phones, if the phone thinks that the WiFi radio is not being used, the phone will take control of the radio and scan the available WiFi channels. When the phone is doing this scanning, the WiFi radio appears to not be available to the FTC app. We do not know the exact purpose of these scans (the manufacturer will not disclose a reason), but if the system thinks the radio is available, it will scan the available channels sequentially. We have documented that when these scans occur with the newer phones (which have the additional 5GHz channels as part of the scan process) the scans can take a relatively long amount of time to complete (greater than 2 seconds) causing the watchdog safety mechanism in our apps to kick in. This watchdog mechanism will cause the Robot Controller to go into an Emergency Stop (E Stop) mode. Note that the heartbeat messages sent by the Driver Station (and acknowledged by the Robot Controller) do not seem to suppress this scanning behavior on the Motorola phones. However, telemetry messages sent from the Robot Controller to the Driver Station do seem to suppress the scanning process. A fix for the FTC apps has been developed that will address this Motorola scanning issue. However, this fix will not be available until after Championship 2019 . Teams who experienced these disconnects, even after they modified the wait for start process as described in the previous Troubleshooting report, seemed to have the disconnects occur during the autonomous portion of their matches. An inspection of their autonomous op modes revealed that these teams often had linear op modes with long (greater than 2 seconds) sleep intervals. To work around the Motorola scanning issue, the teams rewrote their op modes so that if they needed to sleep for a fair amount of time, they would periodically send telemetry messages from the robot controller while they were sleeping to suppress this scanning behavior. For a team that is using an iterative op mode, a telemetry statement can be placed in the loop() method to suppress the scanning behavior. For a team that is using a linear op mode, a custom sleep method can be made which will cause the Robot Controller to periodically send telemetry statements and avoid this scanning behavior. 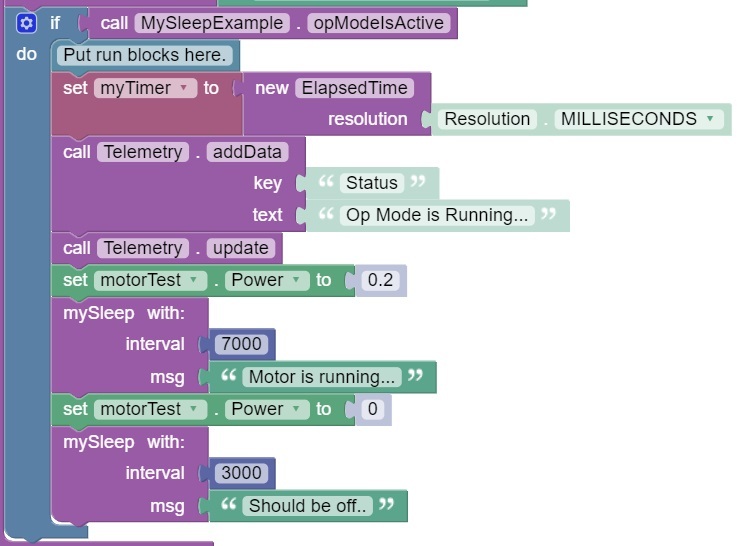 In the following example Blocks op mode, the op mode uses a custom function called "mySleep" rather than the standard sleep block when it needs to sleep during its autonomous run. In this example the mySleep user-defined function uses a timer to "sleep" the requested amount. However, in between periodic sleeps, the mySleep function will also send out an occasional telemetry message to suppress the Motorola WiFi scanning behavior. The Java version of the mySleep method also uses an elapsed timer to send telemetry messages periodically while sleeping. These telemetry statements should suppress WiFi scanning on the Motorola devices. We have had several incidents where FTC (and even FRC) events have been disrupted by the presence of Wi-Fi Blocking technology. A Wi-Fi Blocker or Suppressor is a device (often built-in as a feature of a wireless access point) that prevents people from using an unauthorized Wi-Fi network in the vicinity of the Blocker. If there is a Wi-Fi blocker present, then teams will have trouble connecting their Driver Station devices to their Robot Controllers whenever they are in the range of the Blocker. The Driver Station might be able to see, for example, the Robot Controller listed as an available device, but it would fail to connect or stay connected to the Robot Controller in the presence of the Blocker. A good way to detect a Wi-Fi blocker is to take a pair of the problematic Android devices outside, away from the school's Wi-Fi system. If the devices can pair outside and stay connected (and can run op modes) outside, and if these devices suddenly disconnect once you move them back inside, then you might have a Wi-Fi Blocker present. Note that we have even had an instance of a region that was at a school where they held an event in a prior year without issue. However, the teams were now having problems connecting their Android devices and it turned out that the school had installed a Wi-Fi Blocker in between the previous and current events. If you have confirmed that there is a Wi-Fi Blocker present, then the best course of action is to work with the venue's IT administrator to disable the Wi-Fi Blocker for the event. Note that FIRST has seen instances where the IT administrators did not even realize this Wi-Fi Blocking technology was present. It turned out that their wireless access points had this feature built-in, and they had to modify a configuration file (i.e., modify a "white list") to permit devices with a certain IP address range (192.x.x.x) to be allowed in their venue. At some events, FTAs discovered a WiFi Blocker, but did not have an IT admin available to disable it. The FTAs were able to find the Wi-Fi Blockers in the venue that were located close to the competition field and unplug them for the duration of their event. The FTAs reported that after the devices were powered off, the teams were able to pair and control their robots successfully. Note that the Wi-Fi Event Checklist suggests that an FTA or similar technical volunteer conduct some preliminary tests in advance of an event to check for things like Wi-Fi Blockers. The best way to deal with a Blocker is to detect it well in advance of your event. Thank you Chris and Thank you Westside Robotics! The Motorola E4 phone is approved for use in the FIRST Tech Challenge. In fall 2018, teams reported seemingly random disconnects between the Driver Station and Robot Controller devices when the E4 phones were used. Note that this issue was first reported with the Motorola E4 phone, but it also occurs with the Motorola G5 and G5 Plus phones. The posts suggest that the problem occurs when the Motorola E4 phone is acting as the Driver Station. The phone seems to temporarily disconnect from the Robot Controller and then it quickly reconnects. This can cause a problem when teams experience such a disconnect during a match. 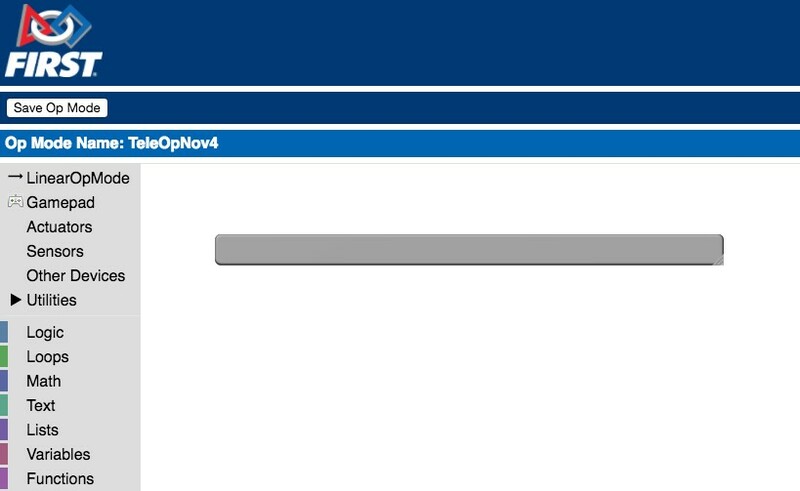 In the snippet of log statements above, you can see that at 12:18:08.541 an Op Mode calls the waitForStart() method to wait for a start command from the Driver Station. Then you can see at 12:19:19.212 the Driver Station logs that it thinks it's disconnected from the Robot Controller since it hasn't communicated with the Robot Controller in over 2 seconds. 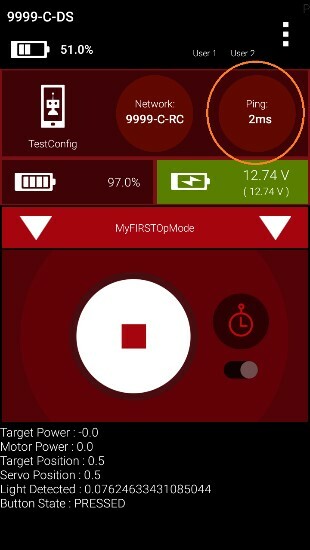 As a workaround to this problem on the Motorola E4 phones, some members of the FIRST community discovered that if the Robot Controller sends telemetry messages to the Driver Station while the Robot Controller is waiting for a start command from the Driver Station, the phones will not disconnect. 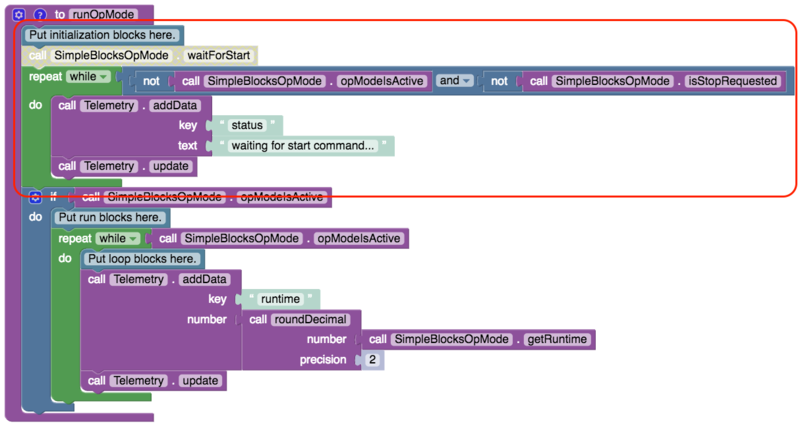 If you are a Blocks programmer, instead of using the "waitForStart" block (which is disabled in the screenshot below), you should use the "opModeIsActive" and "isStopRequested" blocks to create a loop that sends telemetry data to the Driver Station while waiting for the start command. If you use this alternate way to wait for a start command, then the Robot Controller will constantly send telemetry messages to the Driver Station while it is waiting. This seems to prevent the disconnects that are reported with the E4 phones. If you are a Java programmer and you are using a LinearOpMode, instead of using the waitForStart() method (which is commented out in the code snippet below), you should use the opModeIsActive() and isStopRequested() methods to create a loop that sends telemetry data to the Driver Station while waiting for the start command. // Do not use waitForStart() if you have Motorola E4 phones. If you are a Java programmer and are using an iterative OpMode, you should define your own init_loop() method and put a telemetry statement to send data to the Driver Station while waiting for the start command. // you should send telemetry data while waiting for start. If you add this init_loop() method, then the Robot Controller will constantly send telemetry messages to the Driver Station while it is waiting. This seems to prevent the disconnects that are reported with the E4 phones. The section of this wiki with the title Connecting Your Laptop to the FTC Blocks Programming Mode Server describes how to search for the blocks programming mode Wi-Fi network from a list of available networks and then connect to it with a Windows laptop. For some Windows devices, the laptop might not display your blocks programming mode Wi-Fi network in its list of available networks. This problem can occur with some Windows 10 machines (and possibly with some Windows 8 machines), especially if the computer does not have current system updates and service packs. If you are having problems seeing your FTC Blocks Programming Wi-Fi network in your list of available networks, make sure that your Driver Station is paired and connected to your Robot Controller (see the section called Pairing the Driver Station to the Robot Controller of this document). Also, make sure that your Robot Controller is in Programming Mode. Also, make sure that your Windows 10 device has its most current updates installed from Microsoft. If you have verified that the Driver Station is paired and connected to the Robot Controller and that the Robot Controller is in Programming Mode, and if you have verified that your Windows 10 updates are current, then you might have to manually connect your Windows 10 computer to the blocks programming mode Wi-Fi network. You can manually connect to this network as if the network were a hidden network (i.e., a network that does not broadcast its presence to other Wi-Fi devices). Note that it will take an estimated 15 minutes to complete this task. 1. 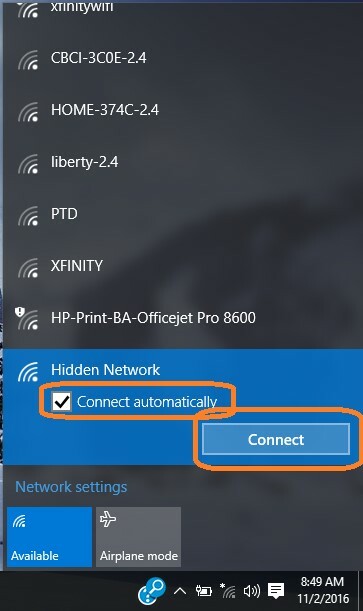 In the lower right hand corner of the Windows 10 desktop, click on the network icon in the system tray to display a list of available Wi-Fi networks. 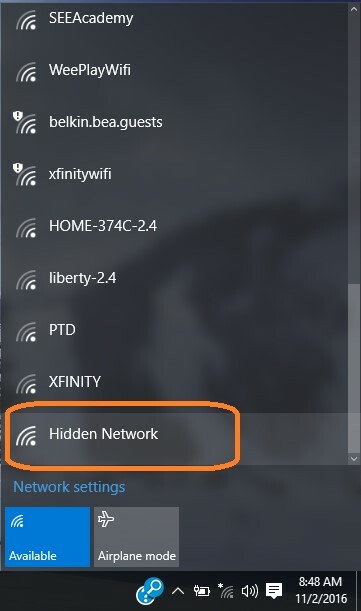 If you still do not see your Blocks Programming Mode Wi-Fi network listed, then scroll to the bottom of the list and look for the item called “Hidden Network”. 2. Click on the “Hidden Network” listing to start the connection process. The listing should display a “Connect” button. Make sure the option “Connect automatically” is checked and then click on the “Connect” button to continue with the process. 3. The computer should prompt you for the name or SSID of your blocks programming mode Wi-Fi network. You should type in the network name that is displayed in the Programming Mode window of the Android device. Note that the SSID or network name is case sensitive. Make sure the capitalization of the name that you enter matches the capitalization of the name displayed in the Programming Mode Window. 4. The computer should then prompt you for the passphrase to access this Wi-Fi network. You should type in the network passphrase that is displayed in the Programming Mode window of the Android device. Note that the passphrase is case sensitive. Make sure that your spelling and capitalization matches the original spelling and capitalization shown on the Programming Mode screen. 5. 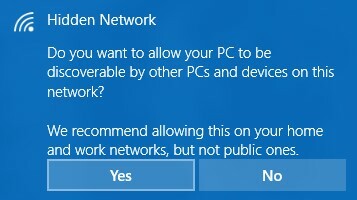 Your computer will prompt you on whether you want to make your PC discoverable by other devices on this network. Click “Yes” to continue. 6. The computer will attempt to connect to your network. Note that it could take several minutes before it connects. 7. If you could successfully connect to the network, it will eventually appear in the list of networks on your computer. Note that when your computer is connected to the blocks programming server on your Robot Controller phone, it will not have access to the Internet. Make sure the Driver Station is successfully paired to the Robot Controller (see section for details). Often the Robot Controller’s Wi-Fi Direct network will time out if it is not connected to the Driver Station. Make sure the Robot Controller has been switched successfully to programming mode (see section 0). Power cycle (turn off and then turn back on) your Robot Controller phone and then relaunch the FTC Robot Controller app. Reconnect the Driver Station to the Robot Controller, and then turn off the wireless adapter on your laptop for a few seconds, and then turn it back on (to force a rescan of the available Wi-Fi networks). Make sure the Robot Controller is in programming mode. Make sure that your laptop is connected to the blocks programming mode Wi-Fi network. If you have verified the first two items, press the “Save Op Mode” button again to re-attempt the save operation. Did you remember to save the op mode the last time you edited and then exited the op mode? If you did not save the op mode after the last editing session, you might have lost some of your changes. Are the blocks collapsed and/or in an area of the design “canvas” (or design pane) that is outside your current browser window? 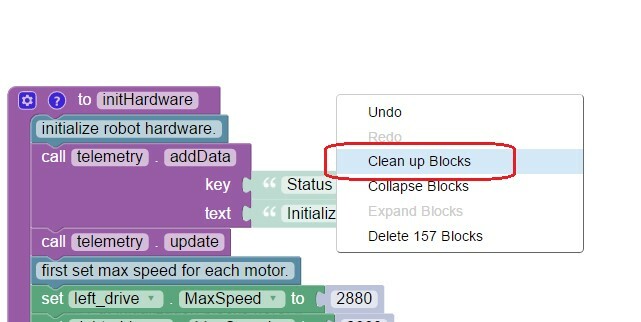 If so, you can use the expand and cleanup functions of the blocks programming tool to expand all the blocks on your screen and to organize them in an easy-to-view (and easy-to-find) manner. Right mouse click on “canvas” and select Expand Blocks to expand all of the blocks in your op mode. Right mouse click on the canvas/design pane and select Clean up Blocks to organize all your blocks. Are your programming blocks missing and you only see a solitary gray rectangular block on your screen? If this is the case, then you should check to see if the active configuration file for the Robot Controller is the same configuration file that you originally used to create the op mode. 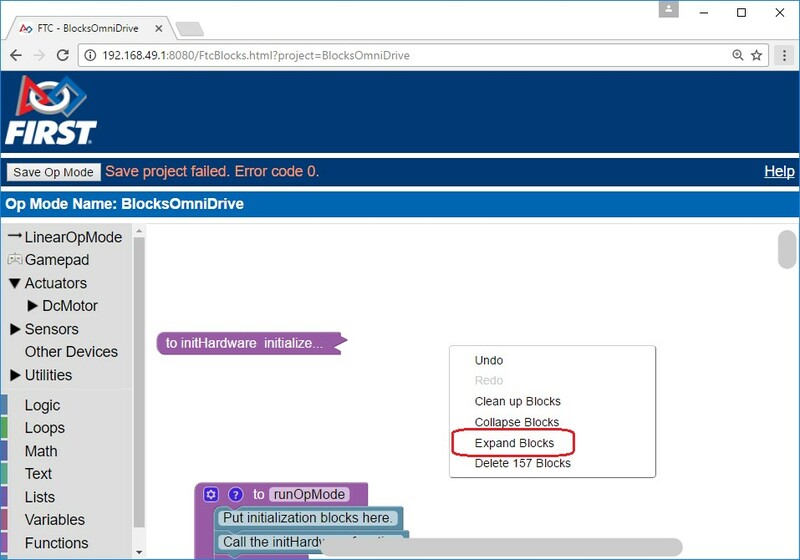 There is a bug in early versions of the blocks programming software that prevents the blocks server from properly rendering the programming blocks if the active configuration of the Robot Controller does not match the original configuration file used to create the op mode. 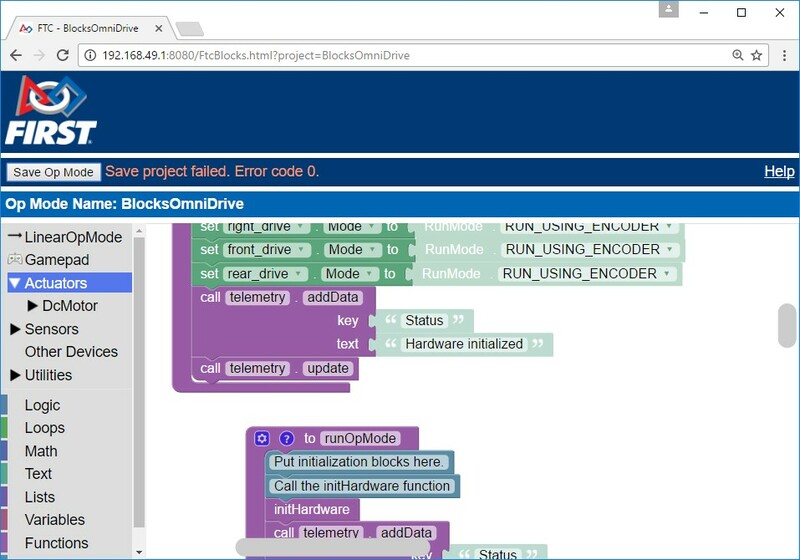 More specifically, if some of the hardware devices (such as the DC motors or servos) from the original file are missing from the current configuration file, the blocks mode server will not properly display the programming blocks in the design pane. Verify that the Driver Station is properly paired to the Robot Controller. Make sure that the Robot Controller is not in Programming Mode. Check the ping times on the Driver Station main screen. The ping time is the average time it takes for the Driver Station to send a message to the Robot Controller and for the Robot Controller to acknowledged that it received the message. If the ping time is low (< 20 msec) the wireless connection between the Driver Station and Robot Controller is good. If the ping time is consistently high (> 50 msec) there could be some wireless interference in your venue that is causing the problems between the Driver Station and the Robot Controller. 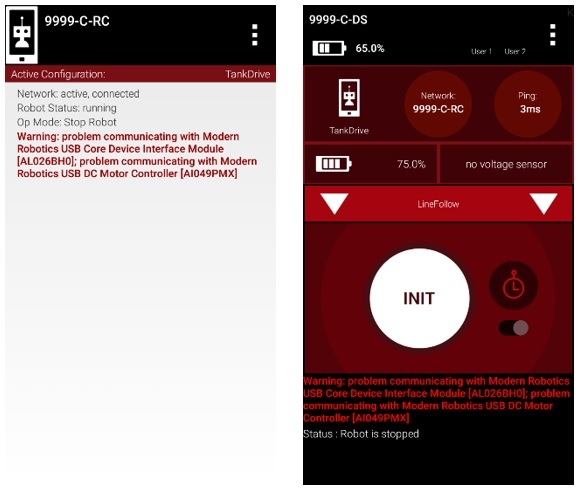 If you are trying to run an op mode and you notice error messages like the ones displayed below, it could be that your wired connection between the phone and the electronic modules is bad. Verify that the USB cable connecting the phone to the Expansion Hub is secure and well connected. Verify that the 12V power cables connecting the battery to the switch and the Expansion Hub are properly secured and connected. Also, verify that the power switch is in the on position. Try to do a “Restart Robot” from the pop up menu (touch the three vertical dots in the upper right hand screen of the Robot Controller or Driver Station apps). If that does not work, disconnect the USB cable from the phone, then shut down the main power switch on the Expansion Hub. Wait for 5 seconds, then power the device back on and reconnect the USB cable to the phone.